this is my first post... i prefer to type in lower cased letters, giving greater emphasis to words that are capitalized, when and if. i will be using this as a sort of shameless self promotion type of, "i cant afford a decent website". so i will post my artwork and adventures on here, mainly me rambling about nothing. 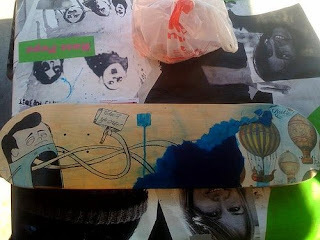 a couple of weeks ago i painted live in tulare, ca at the zumiez couch tour for Keep A Breast. it was boiling hot and literally too hot to paint, my paint was drying as soon as i put it down. 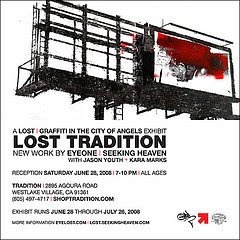 after that, my friend Eye One invited me to be part of an installation/show at " Tradition "... it was awesome. 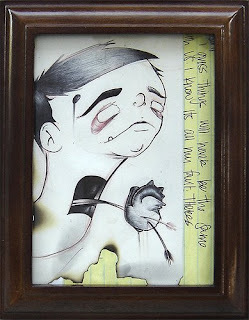 here is one of my pieces that sold, it is titled, " funny like a funeral "